Digitaria, commonly known as crabgrass, is a genus of approximately 220 species of annual grasses. A few species, such as smooth crabgrass and large crabgrass, are considered lawn weeds. Their growth pattern is low and flat; therefore, a patch of crabgrass chokes out other more desirable grasses or plants. Seeds from crabgrass germinate in the spring, grow during the summer, and die in the fall when frost forms on the ground. New seeds lie dormant during the winter and begin a new growth cycle the following spring. Crabgrass often grows along the edges of driveways, sidewalks, curbs, and in pavement cracks. The seeds also grow in thin, bare patches of lawn where they receive ample sunlight. 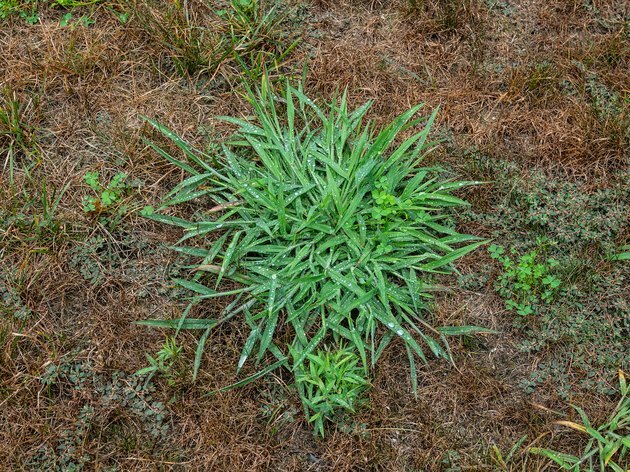 Crabgrass spreads quickly during warm months when each plant forms thousands of seeds, so it's imperative to prevent those seeds from germinating. If your lawn is free from crabgrass, apply a pre-emergent herbicide in the spring. Timing is important. Note when leaves on the trees begin to bud, indicating the soil is warm enough for seeds to germinate. Follow the manufacturer's instructions, taking care to apply the herbicide evenly so that crabgrass doesn't establish itself in an area that was missed. If you already have crabgrass growing in your lawn, apply a post-emergent herbicide to kill the plants. Following the manufacturer's instructions, apply the herbicide to the visible crabgrass. Monitor your lawn for any new crabgrass growth and treat spots where the plants appear. If crabgrass has taken over the majority of your lawn, consider applying the herbicide during warm fall days and then renovate your entire lawn. 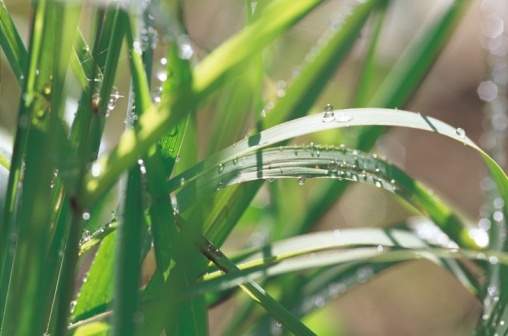 You can prevent crabgrass from growing by maintaining a thick, healthy lawn. Mow your lawn frequently to keep grass at a consistent length. Crabgrass needs a lot of light to germinate, so other thick, long grasses will shade the soil and prevent crabgrass seeds from germinating. Check recommended mowing heights for your type of grass. Water your lawn to promote healthy growth. An established lawn thrives when watered deeply in well-spaced intervals. A newly seeded or sodded lawn should be watered in more frequent intervals with lighter volume. Fertilize your lawn at least once a year. 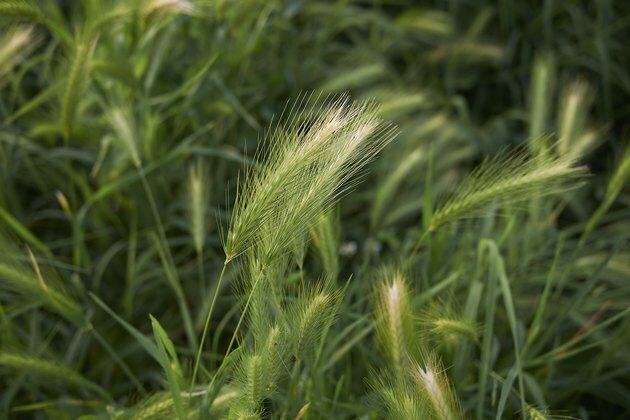 Foxtail is a particularly hazardous grass because the seeds can become lodged in dogs and other mammals nostrils and ear canals. Foxtail clings to people's clothing and causes discomfort while walking with bare feet. Don't confuse crabgrass with other noxious grasses, such as quack grass and foxtail. These grasses are perennials, so the plants do not die during the winter but rather lie dormant and begin to grow again as the weather warms in the spring. Therefore, a pre-emergent herbicide is ineffective in preventing growth. Quack grass, Elymus repens, spreads through underground stems that are very difficult to eradicate, requiring one to dig up and remove the entire root system.